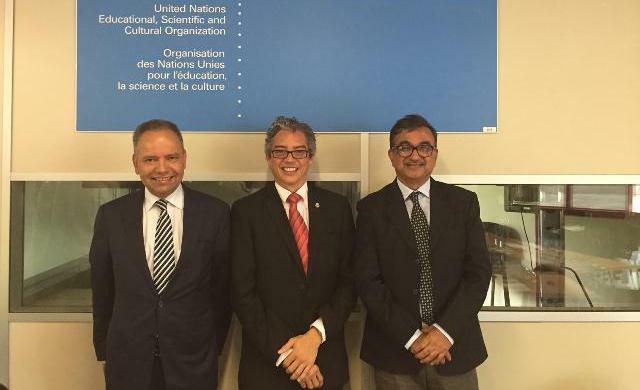 Former Indian Council for Cultural Relations Professor Priyankar Upadhyaya was a keynote speaker at a UNESCO consultative meeting on the contribution of the United Nations System to the promotion of peace in Geneva, on 21 June 2016. Now UNESCO Chair Professor Priyankar Upadhyaya, from the Malaviya Centre for Peace Research at the Banaras Hindu University in India, did provide a thought-provoking keynote speech. “Peace is a process,” he said, highlighting the transformative force of peace, which has led to today’s close linkage between peace and sustainable development. Peace should be seen as an eco-system. A strong focus on prevention and risk reduction cut through all the presentations, with a strong focus on education and a strong interest in sharing lessons learned. In this context, the Director of UNESCO’s International Bureau of Education in Geneva, Mmantsetsa Marope, highlighted UNESCO’s rights approach to education and the centrality of equity and inclusion in today’s education programmes, to counter discrimination – which leads to fractures and tension in society. All participants committed themselves to contributing to a UNESCO-Abat Oliba Oliba CEU University publication, which will be launched on 21 September 2017 – International Day of Peace. To guarantee a broad-based conversation and approach, a second consultation will be held in New York later this year to solicit the contributions of other UN bodies to the study. The consultation took place in the context UNESCO’s research project and partnership with the Abat Oliba CEU University (Barcelona, Spain). The project is managed by UNESCO’s Social and Human Sciences Sector, in collaboration with the Geneva Liaison Office and the UNESCO Archives, under the umbrella of the International Decade for the Rapprochement of Cultures (2013-2022). It aims to shed lights on the United Nations’ accomplishments and added value in the advancement of peace since its creation, as well as its challenges. UNESCO spearheads the project in the context of its mandate as lead agency for the International Decade for the Rapprochement of Cultures (2013-2022). UNESCO article can be found here.